It seems whenever you turn on any news program there’s a frightening story about today’s youth: violence, vandalism, risky behavior and outright refusal to follow parental or societal rules. The fact is there have always been a certain number of people – youth and adults – who engage in criminal behavior, since the beginning of time. In our world of technology, we hear and see it more. A teenager committing a violent act today is likely to end up on YouTube. But what about the parents who hear the stories and think, “That could be my kid” or “Will that be my kid in a few years”? If you’re the parent of a child or teen behaving in an illegal or delinquent manner, chances are you live in constant fear of what may happen next. You wonder, “Is my son going to get in a fight with anyone today? Will my daughter sneak out of the house tonight after curfew? 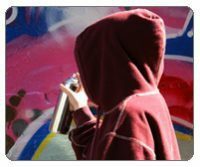 Am I going to get a call from the principal or the police saying my kid spray–painted graffiti all over the school?” Many parents lose sleep from worrying about the trouble their child is already in – or seems bound and determined to get into! The why can, in fact, help us in understanding and sometimes redirecting behavior. For example, if the behavior starts as the result of a loss, like a death or divorce, you can find ways to get professional help for your child. But the fact is, no matter what the why is, we still need to deal with the behavior—and there still needs to be consequences. If a 33–year–old man ends up in court for stealing a car, and says “But Your Honor, I stole the car because I needed the money to pay for food,” the judge isn’t going to say, “Oh, well that explains it. I understand and that’s a good reason. Please go freely on your way without consequence…and pick up some food vouchers on the way out.” So while it can certainly be important to address anything that’s contributing to a child’s delinquent behavior, we still need to hold him accountable. That’s life – for all of us. It’s important to remember that most kids test limits and some may even engage in isolated incidents that are dealt with by giving an effective consequence. Professionals are more concerned when there is a pattern that shows a lack of empathy or disregard for the rights of others. Note: If your child is engaging in a pattern of dangerous, abusive or violent behavior, we suggest consulting with a professional therapist for support and intervention immediately. Related: Is it time to call the police on your child? 1. Hold your children accountable for their actions: We can’t stress enough how important it is to hold your child accountable for his or her actions. This can also mean letting them experience the natural consequences of legal or court involvement. It’s instinctual to want to protect our kids. No parent wants their child to be put on probation or spend time in a detention center. Unfortunately the desire to protect our kids can lead to rescuing them from consequences, which only makes things worse and can reinforce the negative behavior. That’s common sense, right? But have you ever noticed how common sense can fly right out the window when our emotions are involved? If you’re terrified your son may be arrested, it’s hard to listen to your common sense or an “internal voice” that says, “Let him learn from this so he doesn’t do it again.” Our heart plays tricks on us and says, “But maybe he didn’t mean it. Maybe it won’t happen again. A police record will ruin his future.” We want to give our child the benefit of the doubt when in fact, it’s often the worst thing we can do for him. But remember, don’t work harder than your child. That means that you need to let him—and not you—pay the price for his conduct. We understand that it’s terrifying when your child behaves in a way that is dangerous or abusive. As a parent, you should absolutely take steps to hold him accountable: allow him to experience natural consequences even if that means legal charges. Related: Calling the police on your child: A fact sheet for parents. 3. Give Fail–Proof Consequences: If your child is already engaging in delinquent behavior (threats, aggression, stealing, vandalism, staying out past curfew, running away), you may need to involve the police. That’s a hard pill to swallow. Hopefully things will not reach a serious level with court involvement, but it’s important to leave a paper trail to show you attempted to intervene early on with illegal behaviors. Call the police if it’s a legal issue. Ask yourself: “Would I call the police if a neighbor kid engaged in the same behavior?” If the neighbor kid yelled at you and called you a name, you probably wouldn’t involve the police. But you also wouldn’t do favors or nice things for him such as letting him borrow your car or lending him money. The same applies for your child. Kids who frequently break rules without caring about consequences can be tough. It’s easy to get caught up in the idea of “Nothing works – nothing matters to my child.” In fact, your child may act like they don’t care about what consequences you give, but do it anyway and do it consistently. It shows that when your child does A, B will always follow. Fail–proof consequences are those that you – the parent – have complete control over. Grounding is not a fail–proof consequence: your kid can always walk out the door or sneak out the window. Not giving her money or buying her special things like make–up, designer clothes, or fast food are fail–proof consequences. She can’t force you to spend your money. Your child may act like she doesn’t care. She may continue to make the same choices, without changing her behavior. But you – the parent – have shown her what happens in “Real Life.” In the Real World, there are consequences; whether or not you decide to change your behavior is ultimately up to you. Some people become uncomfortable with negative consequences quickly and change their behavior right away. For others it may take some time. 4. Find support for you. One of the hardest things you can do as a parent when your child is acting out or engaging in risky or delinquent behavior is to go through this alone. It’s natural to feel embarrassed or ashamed, but realize that many, many other parents have faced these problems with their kids and come out on the other side. You don’t have to go through this alone. Try to find help in the form of a support group, a trusted friend or mate, a counselor, or the community here on EmpoweringParents.com. 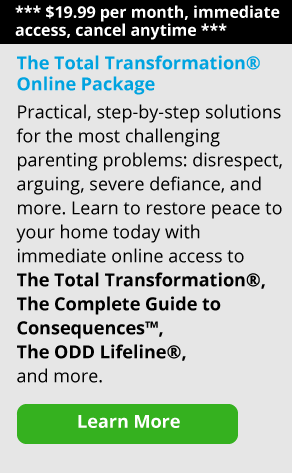 Our program, the ODD Lifeline, was developed for parents of Oppositional Defiant kids, and teaches you different techniques as a parent to help you handle the behavior and not personalize it. James and Janet Lehman’s Total Transformation is another great tool for parents of acting out kids – and typical kids who act out occasionally. The point is, there is help out there for you if you need it. Think about any change you’ve ever made in your life, whether you quit smoking, ended an unhealthy relationship, changed jobs or lost weight. You made the decision to change your behavior because you were uncomfortable enough to do so. You weren’t okay with some of the current or potential consequences any longer. Our kids have the ability to change their behavior, too. It’s often the motivation they lack. As a parent, you can’t control your child’s behavior, but you can help motivate her to change by making her uncomfortable with her behavior. It’s hard to watch our kids make what we consider to be poor choices. But we can still love them. We can continue to guide them as best we can. And most importantly, we can continue to hold them accountable now so they understand that society will hold them accountable as adults. It’s the best we can do.